Sweeping changes are afoot for Sentosa, the adjacent Pulau Brani and the waterfront along Tanjong Pagar, with plans being made to develop new attractions and brand the area as the Southern Gateway of Asia. There are plans, for instance, to reshape the entire Sentosa Island to provide scope for more leisure amenities and investments, and to allow better infrastructure and accessibility. More hotels and other facilities for activities related to Mice (meetings, incentives, conferences and exhibitions) are also among the possibilities for the larger precinct. These were announced by Senior Minister of State for Trade and Industry Chee Hong Tat at the opening ceremony of travel trade show ITB Asia yesterday. The relocation of the port terminals including those at Tanjong Pagar and Pasir Panjang to Tuas will free up some 1,000ha of land for a new waterfront city. Earlier announcements have dubbed it the Greater Southern Waterfront, which will have housing as well as commercial and entertainment facilities. Mr Chee said yesterday that government agencies are drawing up development plans for Pulau Brani and the Greater Southern Waterfront, and "this expanded canvas, which is as large as Sentosa Island itself, will provide exciting opportunities for us to develop new tourism attractions and anchor this precinct as the Southern Gateway of Asia". Speaking to the media after his speech, Mr Chee said that with the port at Tanjong Pagar moving out in the coming years, an overall view has been taken on how the whole area can be developed for tourism as well as commercial and residential purposes. The growing cruise industry may also be part of considerations, and there is scope for the Marina Bay Cruise Centre to be developed further, Mr Chee said. 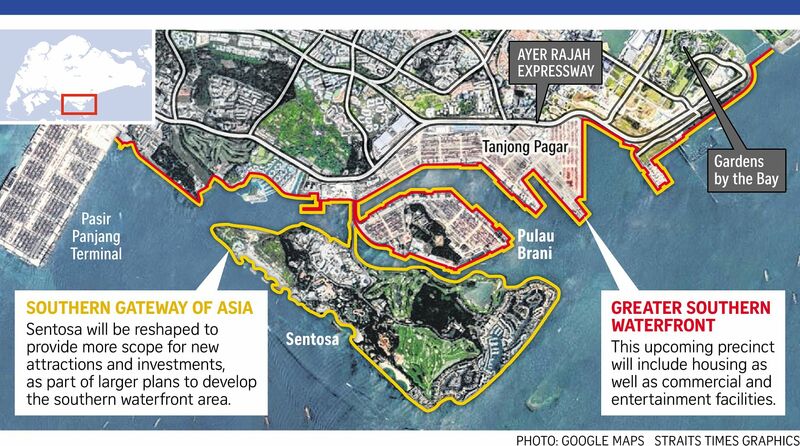 As for Sentosa, he said it must be "well integrated with what we are going to do on the main island of Singapore". "One area which I am personally very keen to explore and push ahead is how we can encourage more activities at night on Sentosa," Mr Chee said. Addressing the opening of the three-day conference and exhibition at the Sands Expo and Convention Centre, he said the Government's overall tourism strategy includes investing in quality attractions and reinventing current ones. For example, Orchard Road, the subject of an ongoing study of measures to rejuvenate the precinct, can be more than Singapore's main shopping belt, he said. It can be a "green oasis in the city centre" and an innovation district for companies, including start-ups and social entrepreneurs, to test new ideas. More details on the plans for both Sentosa and Orchard Road will come in six to nine months, he told the media. Sentosa Development Corporation's assistant chief executive Jacqueline Tan said in response to queries that there are plans to strengthen the island's leisure experiences through new attractions, improvement of transport connectivity and enhancement of its beaches, through a masterplan for 2030. Ngee Ann Polytechnic's senior tourism lecturer Michael Chiam said integrating Sentosa with the larger precinct may help to drive traffic to the island. More nightlife and better transport options are must-haves for Sentosa, while plans for the nearby Pulau Brani may involve "creative ways to connect to Sentosa and have resorts, waterfront activities, F&B and entertainment", he said.